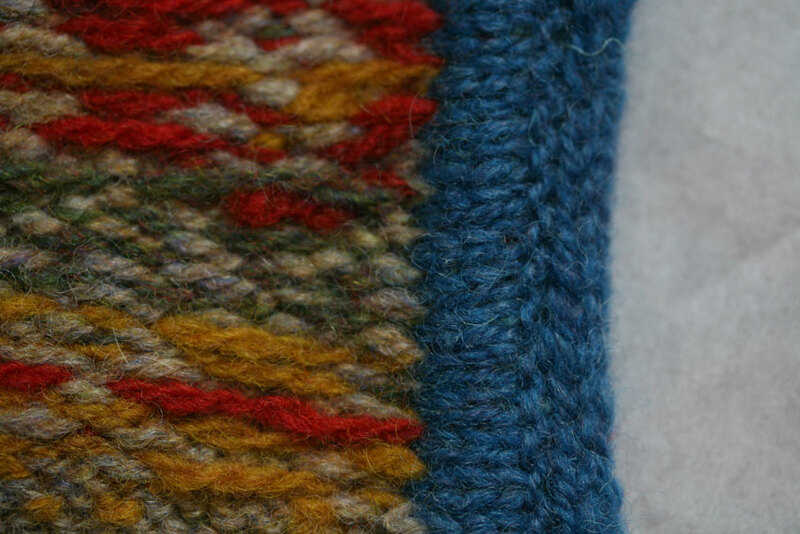 In this post, I’m going to show you how to further reinforce (and cover) the cut edges of your steek using a techique that I’ve called “the steek sandwich.” There are many other methods of binding / covering steek edges – but this one works well, I think, for a steeked cardigan. The front edges of a cardigan generally see a lot of strain because of the opening / closing action of buttons and button holes – and this method provides a strong facing as well as a stable edge where the garment needs it most. Above, you can see the wrong side of the swatch where we left it yesterday, with the steek cut, and the crocheted reinforcement holding the cut edge. In the steps that follow, I’m just going to describe exactly what I’m doing, and provide a little more explanation at the end. 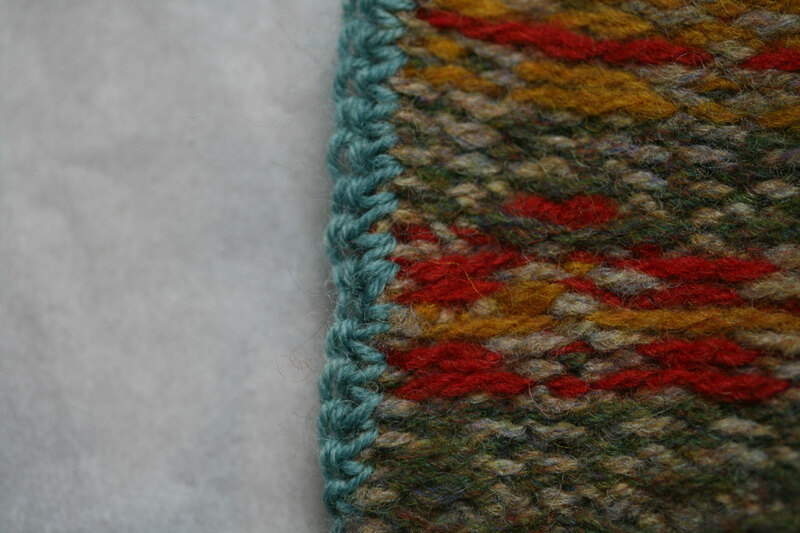 First, with the right side of the swatch facing, pick up and knit 3 stitches for every 4 rows, plus an extra 1 stitch each for the top and bottom edges. (I’m using yarn in a contrasting colour so you can see what I’m doing). 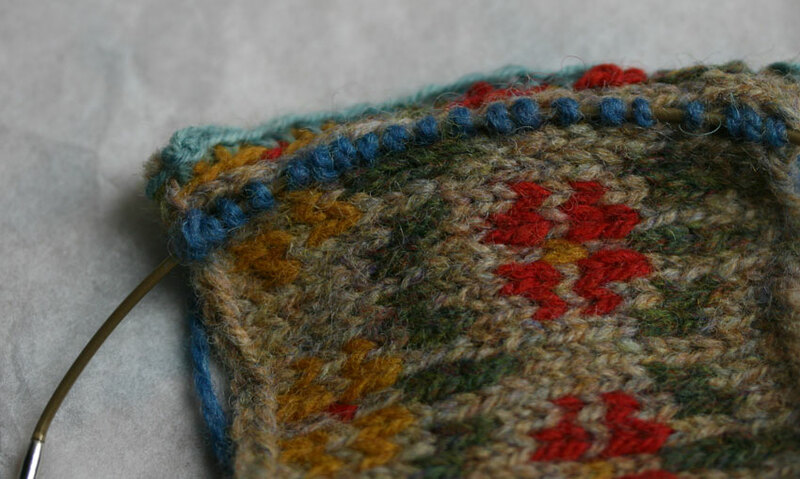 For the edging to sit flush against the main pattern, you should pick up your stitches in the gap between the outermost steek stitch and the first stitch of the pattern. 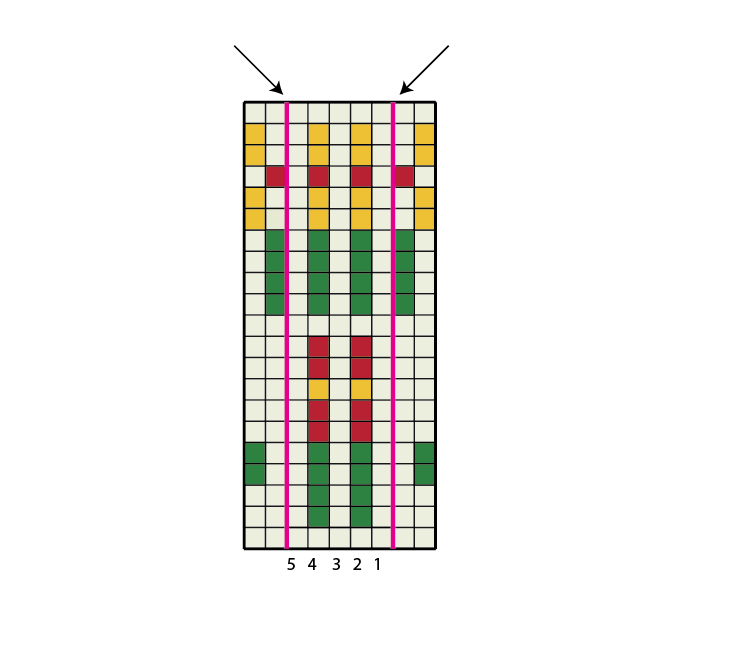 In the diagram below, there are two pattern stitches on either side, and five steek stitches in the middle. The pink lines show you where you should be picking up your stitches. 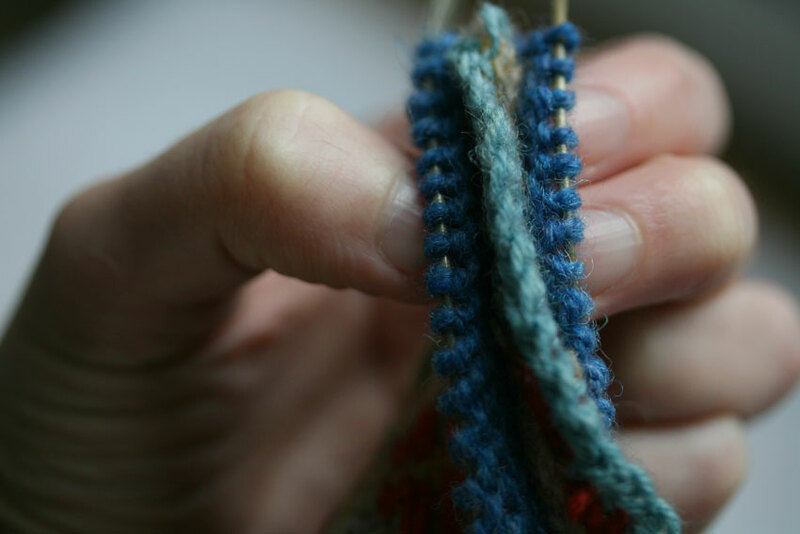 When picking up your stitches, make sure you push your needle all the way through to the back of the work, and draw the yarn through from the wrong side (this may sound obvious, but people do pick up stitches in quite different ways . . . ) So, when you have finished, you should be able to see the backs of your picked up stitches on the reverse of the fabric. The backs of your stitches should resemble a line of sewn running stitch. 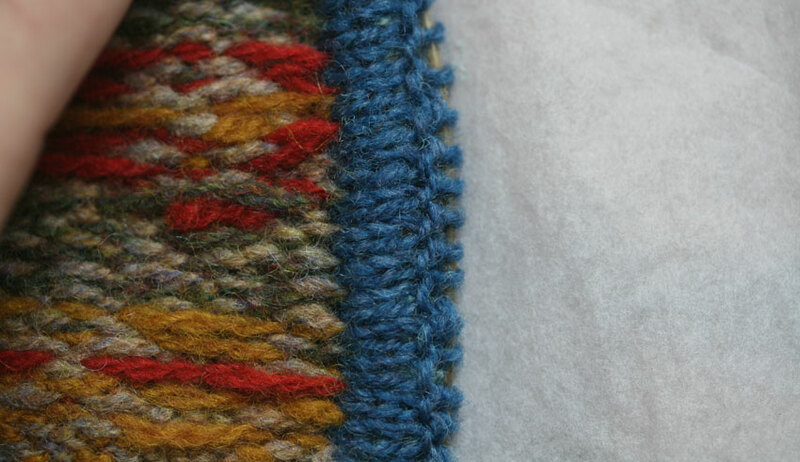 And just as a running stitch would, these stitches are further securing and holding the cut edge of your steek. That steek is going nowhere! Now, beginning with a purl row, work in stockinette for four rows. Keep these stitches live on the needle: don’t break yarn. Here are these four rows from the right side. And here they are from the wrong side, with stitches 1 and 2 of the steek, and the chain of the crocheted reinforcement visible behind them. 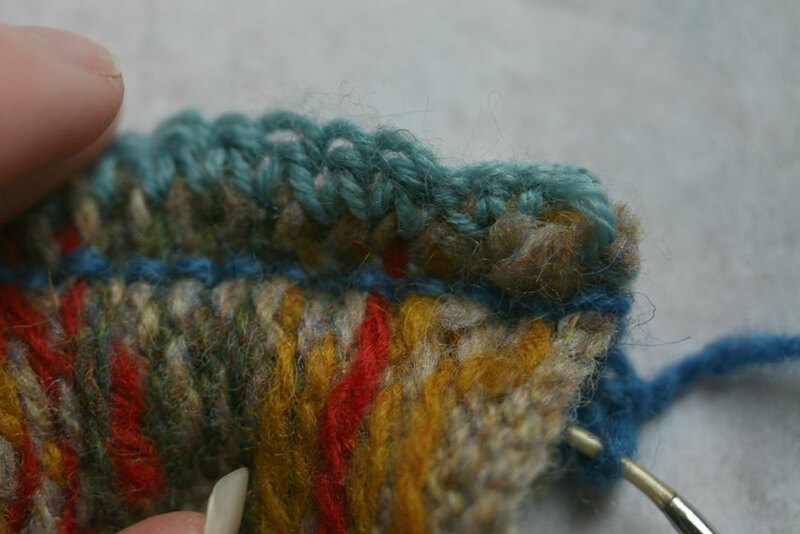 Sitting underneath the steek, you’ll see the back loops of your previously picked up stitches. Bring the working yarn round from the right side, and work in stockinette for 3 rows, beginning with a knit row. Keep these stitches live on your needle: don’t break yarn. The sandwich is now forming: four rows of stockinette on the right side, three on the wrong side, and, in the middle, the steek stitches and their crocheted reinforcement. This next step is a bit fiddly, so take your time. Turn the work to the right side. 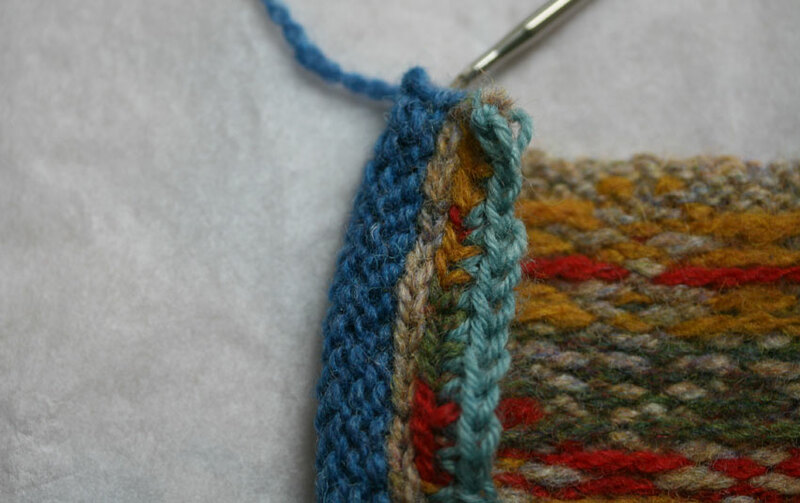 You have two sets of stitches running parallel to one another: one set on the front, and one on the back needle. Bring the working yarn around from the back and, with a third needle, knit one stitch from the front needle together with one stitch from the back needle, covering and containing the steek stitches and the crochet chain. When you have knitted each front-needle stitch together with its corresponding back-needle stitch, you end up with this. All that remains is to bind off the live stitches. Here, I’ve used an i-cord bind-off (knit 2; knit 2 together through-the-back-loops) (particularly useful if you are working a button / buttonhole band). Here’s the finished sandwich from the right side . . .
. . . and the wrong side. 2) Because you just pick up the reverse loops from the right-side stitches, you end up with two perfectly aligned stockinette flaps that can neatly be knitted together. 3) No need to worry about whether you’ve picked up the right number of stitches on either side: the number of stitches is always, inevitably the same! 4) You can weave in your ends by pulling them inside the sandwich. :: You can of course, work more rows to create a deeper facing. I’ve worked the minimum here: just enough to fit the steek and and its reinforcement inside. :: I worked the i-cord bind-off from the wrong side. Personally, I like the way this looks. :: The ‘sandwich’ is formed from three layers of fabric and, as you’d imagine, has a solid, almost quilted appearance. I think this is great for the front openings of a cardigan, where a facing is often necessary anyway. It also works well as a blanket edging, but because it adds bulk, would probably not work so well elsewhere. If this rain ever stops, I’ll soon be able to show you how the sandwich looks on a finished garment! Also, I noticed that there were some good questions on my previous couple of posts. I thought I’d answer a few of these (those that I can!) in a final installment of this steek series tomorrow, so if there is anything you want to know that I’ve not covered, or that seems unclear, please say something below. Kate, I can’t begin to tell you how useful your posts on steeking are: you cover everything with great clarity and simplicity – THANK YOU! There is a lot information about how to prepare and cut your steek but very little about finishing up. Your tutorial covers it all in very clear and easy to follow manner so thank you very much for taking time and effort. Appreciate it. Your written instructions are so clear and easy to follow. I made a steek sandwich out of my swatch for practice, in one try, and I love the concept. However, I am working with a bulky cloth (Alafoss Lopi on 4.5mm and 6mm needles) and the sandwich is quite thick. Do you have advice for creating such a neat, stable steek on a bulky sweater? Thank you so much for the excellent explanation. It’s the only “steeking lesson” I’ve understood and I’ve been knitting for forty odd years. You’re a needle genius! Could you show in a picture how the facing looks folded over and sewn down? These are excellent tutorials, all of them. Such neat work and so professional. Thank you. This is officially the most amazing knitting revelation I’ve ever had. This does away with all the problems I’ve been having re cardigan button bands. Thank you soooo much! Somebody asked where the word steek came from – in Dutch it is the old “surname” for several knots that sailers use. To tie up the boat to a pole (paal) they use the paalsteek! Today the dutch word steek means only stich. Happy knitting to all! Second the genius part :-). I’m thinking also that instead of knitting the edges together a nice 3-needle bind-off would be perfect for a strong, stable edge such as a neckline. Wow, I can feel a steek coming on :-). You, madame, are a GENIUS! These posts are going to my bookmarks and my printer, I’ll be doing this soon! THANK YOU! Wow! Thank you SO much for explaining steeks in so much detail. Your posts actually make me want to cut up my knitting. I will be using this. Thank you for sharing your knowledge and expertise with us. That is an absolutely gorgeous finish. I really wish I could have read this post before I spent £40 plus travel on a steeking class where the teacher announced there wouldn’t be anything much about finishing (in a 3-hour class!!). Excellent, thank you. Another fabulous explanation. However, my steeks are rather thick already as I have finished all my ends within the steek – all done before I read your instructions. I will try the steek sandwich on my next steeking adventure…. Onwards with the other armhole today! waouuuu ! These techniques seem so clear : I’m looking forward a peerie flower cardigan for a looong time…I just try to finish all my knitting affairs to be ready to start your new creation ! Thanks a lot for the precious tutorial and the time you take for explanations ! Thank you so much for this steek series. I was just considering cutting my first steek and your tutorials are exactly what I need! That produces such a lovely clean finish. Thanks for those 3 posts, I really enjoy cutting up my knitting, I’ll be able to do it so much neater now! Instead of the I-cord bind off, could the front and back “facings” be kitchenered? I LOVE your steek series!!! Thank you for the lovely tutorial. It’s very thorough and clear. Thank you, Kate; I have the Rams & Yowes kit from J&S – knew it was going to be a learning curve with steeks, but this explanation is so clear. Looking forward to making a start! 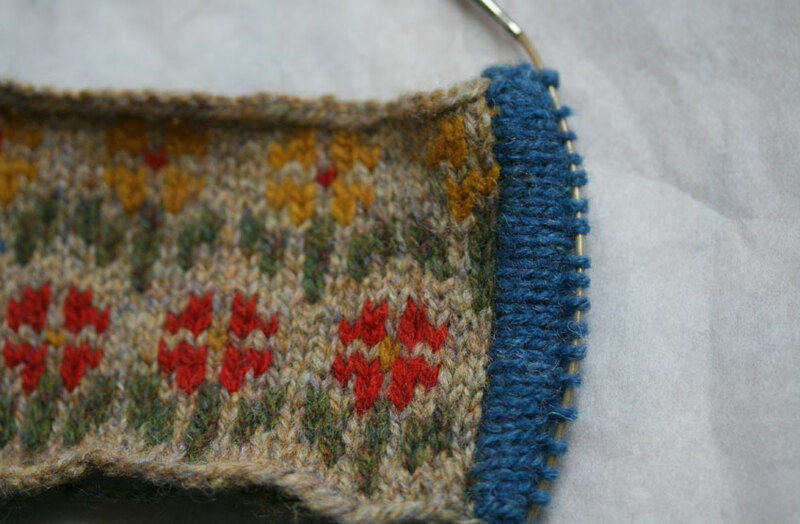 Thank you so much Kate, this has to be the best explanation of steeking that I’ve ever seen and I am not going to let the tag “steek” put me off patterns again. My question relates to this instruction “When picking up your stitches, make sure you push your needle all the way through to the back of the work, and draw the yarn through from the wrong side”. So are you creating new stitches thru the knitting rather than picking up stitch from the front ie the already knitted stitches? Thank you so much for this tutorial. I have always been afraid of steeks. Now I can’t wait to give it a try. I do have one question about the crocheting bit. Does the weight of the yarn used make a difference? Should it be the same or lesser weight than the garment? I’m not afraid of steeks, but I’ve never tried them. This tutorial serie is the best : so clear and well explained. That last part on the sandwich is just brilliant ! Thank you so much for writing this, Kate. Ok, now I find the urge to knit the Rams and Yowes blanket even stronger ! Beautiful! I love it. Just one question: Which column of stitches do you pick up your “sandwich” stitches from? From the last column of the steek? Or the first pattern column? Or something else altogether? The closest I’ve ever come to steeking was with a stockinette cardigan knit in a worsted weight wool. In the end, I wimped out because it seemed as though the button band would be too bulky. 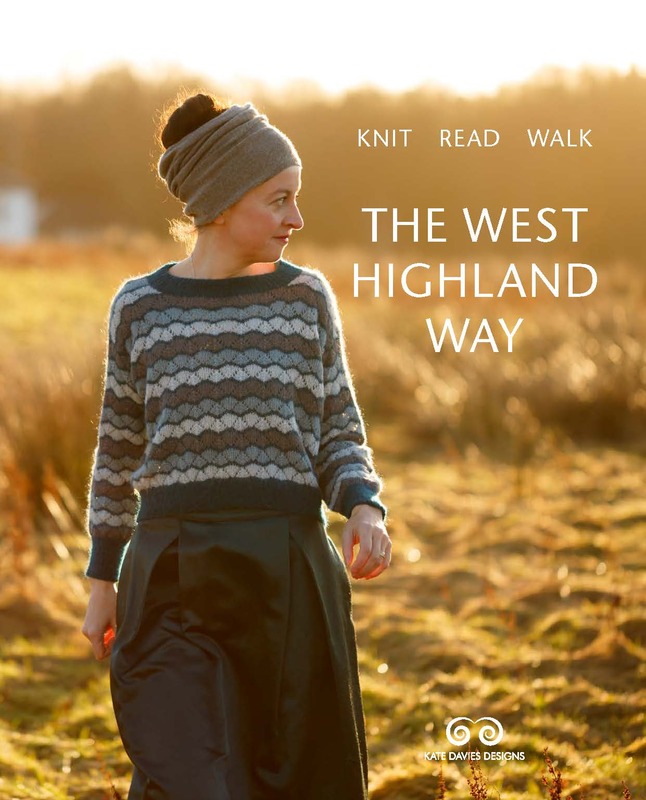 Any words of wisdom about steeking with heavier-weight wools? Yes, I’d also like to know how far in from the edge of the steek to pick up and knit the first layer of the sandwich. Also, I’m wondering: you said that the number of picked up stitches always should equal exactly the number of loops showing on the back of the fabric (those that are used to create the last layer of the sandwich). But, according to the “fence post rule,” there is almost one more post than section of fence, so shouldn’t there be one fewer stitches on the back side than on the front, leaving you with one extra stitch on the front side when you are knitting the sandwich together? I also could state my question this way: if one were to pick up and knit stitches using yarn that wasn’t attached to anything first, then the yarn would come up from the back side of the fabric to the front create a stitch over the needle, and descend again to the back side. The actual “loops” on the back side are created BETWEEN the new stitches that are being picked up on the front side, so wouldn’t there be one fewer loops on the back than there are new stitches on the front? Finally, for those of us who are not familiar with the i-cord bind off especially in this setting, would you please demonstrate this in a photo tutorial? Thank you. That was the only place in your absolutely magnificent post that I felt as if a step got skipped over a bit too quickly. I have to say: I have always believed that I couldn’t steek anything because I don’t own a sewing machine. I am very comfortable crocheting and thrilled that I could actually make a steek without the benefit of sewing. Thanks so much Kate for your time doing this. 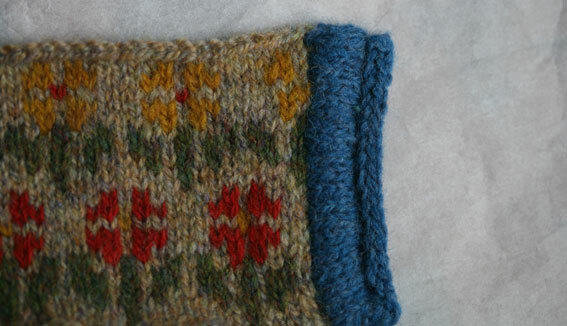 My question is would you be able to show on swatch where you picked up the (3 sts into 4 rows) stitches. That’s all. I’m in awe! Wow! What a super cool method, and you make it look so easy! I can’t wait to try. Love it !!! I’m on the edge of my seat ! Just got back from yoga feeling blissfully happy and thought hey lets have my dinner and check out the traffic on the blogosphere. Yippee there’s a post from Kate about steaks – what is the history of this word I’m wondering – anything to do with steaks – is it pronouced completely differently. 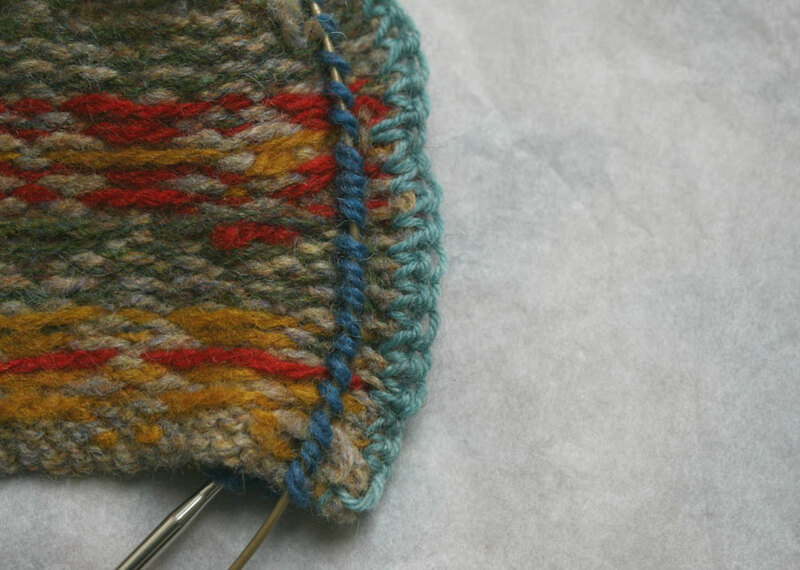 I’m not really a knitter but love the blog. Anna x, ps its raining here too in Devon, still – the ducks are happy but the lambs have had enough. Fabulous tutorial, thank you so much! 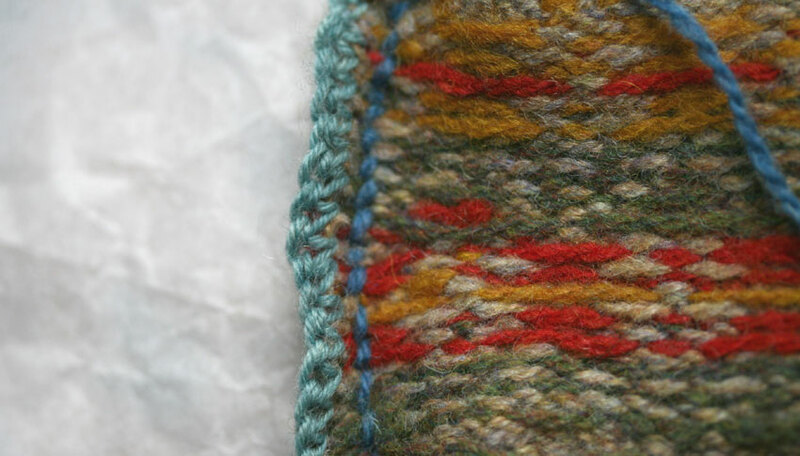 I expect this way of finishing would work just as well for an “ordinary” cardigan edge… wouldn’t it? This is so fantastic! Thank you so much for taking the time to create this tutorial! Thank you Kate for this very clear explanation and very clear pictures. You rock!!! Thank you for your patient explanation, now I can consider doing the Sheep & Yows blanket (I’ve done the tam – so that’s one mountain climbed!) Can I show my total ignorance and ask you to clarify the i-cord bind off…now that’s scary!! Really clear directions; I’m ten times more confident about steeking than before. Might even try it one day! This series is the first thing I’ve read about steeks that has not been terrifying. Something very bracing about your tone, Kate. Thank you for all the reassurance in the first part. Without that I wouldn’t have been able to move on to the subsequent parts. It doesn’t really make me want to run out and steek something, but I’ll be much less likely to dismiss a pattern immediately upon seeing the word “steek” as I have been wont to do. 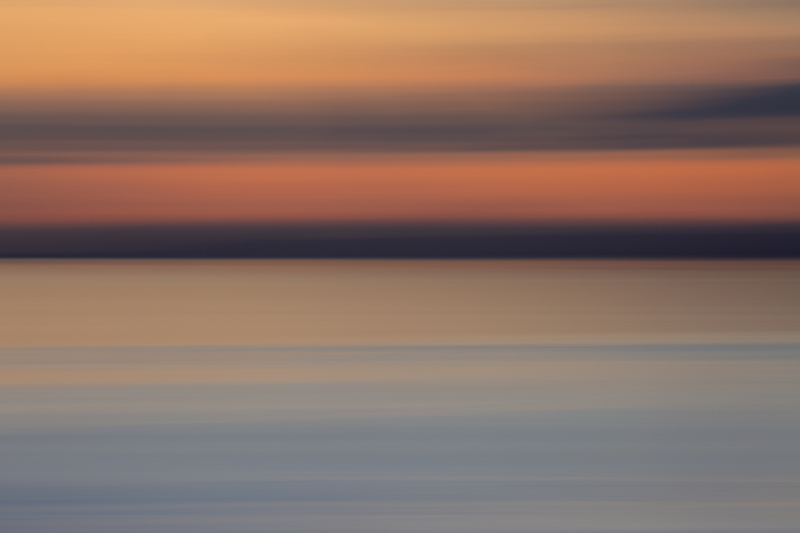 Thanks so much for the wonderful steek tutorials, with so many detailed directions and excellent photos. For me it is perfect timing, as I am just about ready to do my “Rams and Yowes” steek. I appreciate how much time and effort you have put into this! That is just so cool! I’ve actually never really heard of steeks before so this has been very eye opening. Thanks for the time you spent on this, I’m now excited to give it a try! Okay, that is officially the smartest thing I’ve ever seen. Thank you so much for sharing this whole series! Such a neat solution!Look forward to learning more! Thanks for this – sorted out my issues with picking up stitches. Brilliant, clear tutorial, thank you. Thank you so much for this; I’m inspired! Thanks Kate! I love your designs and will be getting your lovely sheepy blanket kit soon (I hope). This will be a great way to finish it. Your explanations have been great & have gotten me over my fear of steeks & actually eager to start my first Fair Isle project & first steeking. 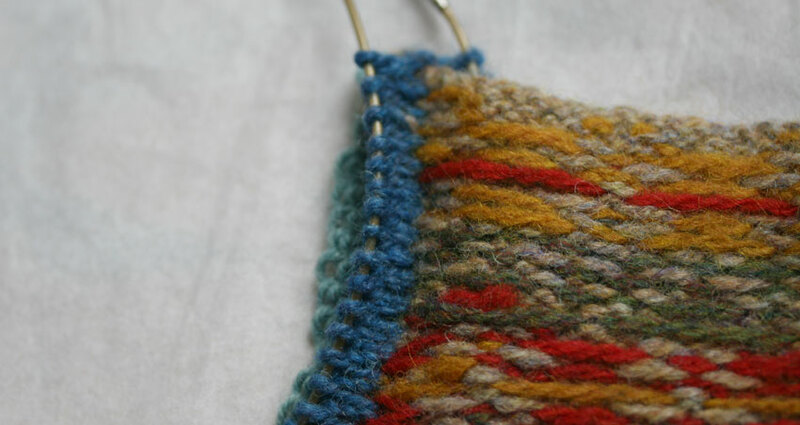 One question, instead of using an I-cord bind-off, could you close the steek sandwich with a 3-needle bind-off instead? Thank you, Kate, for being so generous as to share your expertise. This is a fabulous way to finish the front of a cardign………my question is, why do you have to initially finish your ends by weaving them into the fabric of the body. 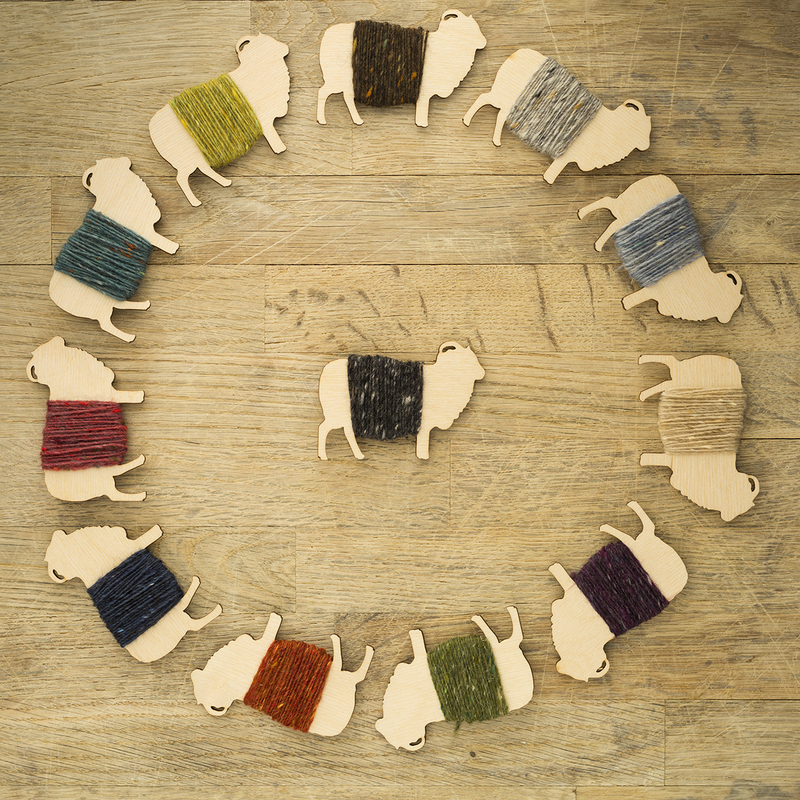 When yarns are stopped and started in the middle of the steek……all of these ends are trimmed off when the steek is cut, in whatever steek treatment used, eliminating the need for them to be woven in. I look forward to your new pattern using this technique. This is all really wonderful… thanks so much for your quite clear explanations. Will you also show how this relates to a button band? Gives me confidence to try a steek. 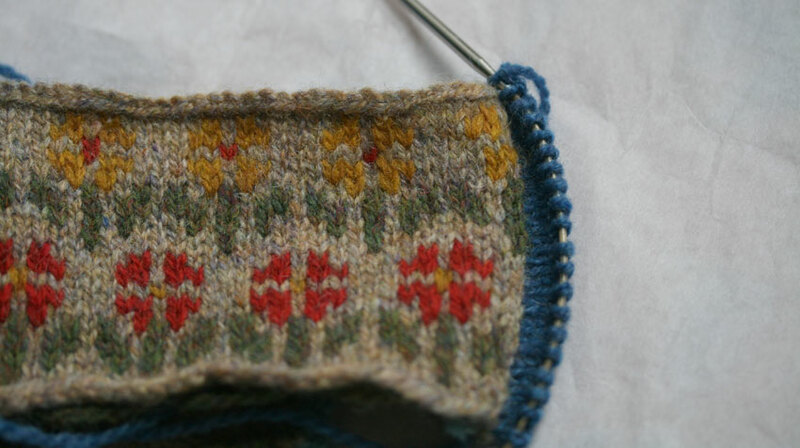 I’m going to do a swatch as you have shown and give ‘er a whirl. When you knit one stich from the front and one stitch from the back together, could you also knit the ending loop from the crochet chain or would that pull on the chain and make it less stable? Also you say you use this technique for button-bands, is the whole facing the button band or do you then pick up stitches from the facing to create the button band? Thank you for the clear images. I think I will have to finally try steeks soon! Laurence B’s second question is just what I was going to ask. So that makes two of us who want to know how to go from sandwich to button band. 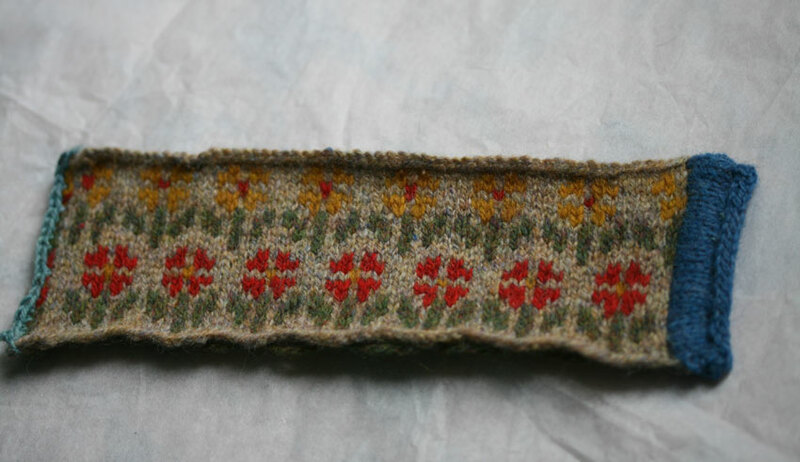 The buttonhole band is even more finicky – or do you always use snaps for closure and buttons for ornament?